This 12MP IP Dome camera is the highest resolution security camera that CCTV Camera World offers. Not only can it produce Real Time 4K video at 30fps, it can also produce 12MP video at 20fps. The camera has a Starvis image sensor to provide crisp clear Ultra HD video that will simply amaze. It also offers multiple intelligent video analytic functions to detect objects and notify you about intrusions or missing items. In addition to motion detection that is offered in all security cameras, this camera's tripwire function minimizes false positives in motion detection by intelligently looking for actual motion over a virtual tripwire. This 12MP Security Camera has a motorized zoom lens that can be controlled from the NVR, or over the web from anywhere using your web browser, or app. From this 12MP IP camera you can expect 75ft of facial detail at the widest angle of view of 105°, and up to 180ft of facial detail with full optical zoom at a 35° angle of view. For recording, as with any of our IP cameras you can record to an NVR, PC, or a Micro SD Card inside the camera. To save bandwidth, you can take advantage of the H.265 video encoding to record more video in the same storage space compared to H.264. H.265 encoding offers a more efficient way to compress video than H.264. It offers nearly double the data compression ratio delivering the same video quality while saving storage space. For best compatibility and ease of use we recommend using one of our 4K NVRs. You can either use a 8MP max recording resolution NVR to record video from this camera at 4K 8MP, or use one of our 12MP compatible NVRs for the highest recording resolution. Physically the camera is built tough. It has been tested to be vandal resistant and certified IK10. It is also weather resistant in compliance with IP67 standards. It is important to place the glass dome cover on the camera correctly to protect it from water damage. Is this camera, i.e. 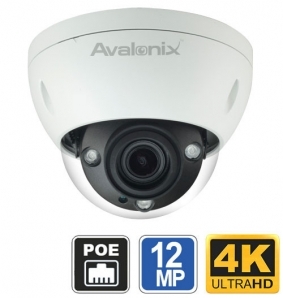 (the 12MP 4K HD IP Dome Camera, with 4X Zoom,SKU IPC4K12D) wifi capable? Is anything else required to work with the camera, other than power? This is a hardwired IP camera. It is not a wireless camera. 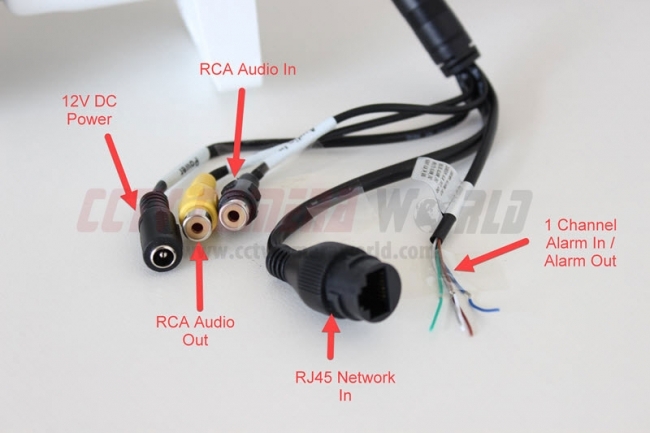 You can make a wired ip camera in to a wireless security camera by following this guide. All security cameras support one setting each for main stream and sub stream. Below is a table with some examples of bit rates when using this 12MP Security camera. Bit rate is the actual bandwidth required for the video stream at the specified settings. Motorized zoom security cameras such as this are by definition only motorized zoom. Pan and tilt features are only available in Pan Tilt Zoom cameras (aka PTZ cameras). My last Outdoor cameras failed due to high Texas Heat. What temperature are these cameras rated for? The Temp rating is in the specs table located at the end of the product description. It is up to a Peak temp of 140 degrees F. That doesn't mean a continuous temp. To increase longevity of a security camera when it is used in locations where the Sun is very intense, we suggest using the camera underneath an eaves. Any of the following NVRs that support up to 12MP security cameras can record all 12MP cameras if needed. You just have to make sure that your total recording bit rate is under max recording bit rate for the NVR. Each 12mp can take up to 20mbps of bandwidth depending on the settings you have it at.